Disclaimer – I have been provided with free goods to review but was under no obligation to post a review on my blog. I have done this purely out of interest of sharing my thoughts with my readers and to encourage discussion. Everyone has heard of the theory that music played to plants helps them grow. In addition to that they launched MOG, an online music streaming service designed to compete with other sites like the ever-growing Spotify. The people at MOG asked me to trial the service for a month, and also sent me a complimentary juice to try. Given that I'm a big user of spotify, they wanted my opinion on how I found the experience in comparison. For me, the unmetered feature is HUGE, and something that definitely makes me tempted to jump ship from my pro subscription with Spotify when my trial subscription with MOG is up. I have always been worried about streaming on my phone with Spotify purely because of the usage charges. As a Telstra customer, I wouldn't have to worry about that anymore, and I'm not going to be changing from Telstra any time soon (I have learned my lesson in trusting other providers, never again). I know that both Spotify and MOG have the ability with premium subscription to download playlists so that usage shouldn't be a problem, but what if there's a new album that you just heard of that you want to stream? What if space on your phone/device is an issue, and you want to conserve it by not downloading the music? 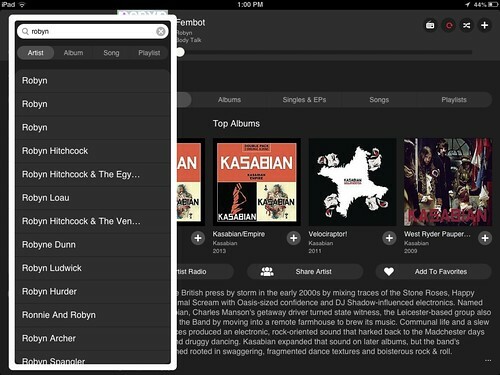 With regards to the interface, I don't find MOG to be as easy to use and straight forward as Spotify. It looks nice, but I think the functionality could be improved. 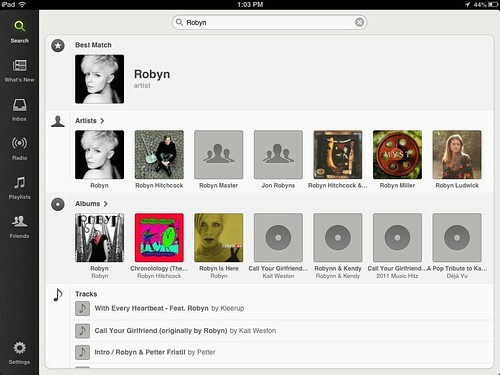 For example, searching for Robyn, in MOG I get a list that shows there's actually more than one artist with the name of Robyn (not exactly surprising). But I have no idea which one it is that I want, so I have to just click on one and hope for the best. If its not that person, I have to do the search again and remember which one I clicked on last time so I dont load that one again. 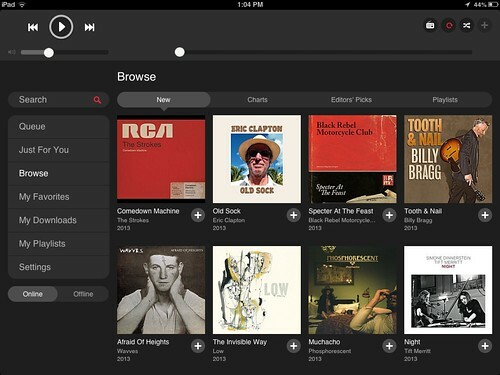 With Spotify, you get a recommendation on the best match with images and suggestions of other artists. The other negative for me with MOG is there is no free version. With Spotify, there is a free version but with ads. It's a small price to pay to still be able to select whatever music you want. It's also limited in that you can't play it through your iPhone, so you're restricted to your computer. But if you are someone that plays music through the speakers at home a lot, and you can do that for free, I'm sure the ads aren't going to bother you all that much. While both services offer mobile versions, it's only available on the premium plan. For me, I always use my phone for music when I'm on the go, so either way I'm looking at the premium option for Spotify or MOG. I already pay $12 a month, and with pricing being the same for both it really boils down to the extras for me, rather than any cost savings. Which is when I checked the App Store for Spotify. 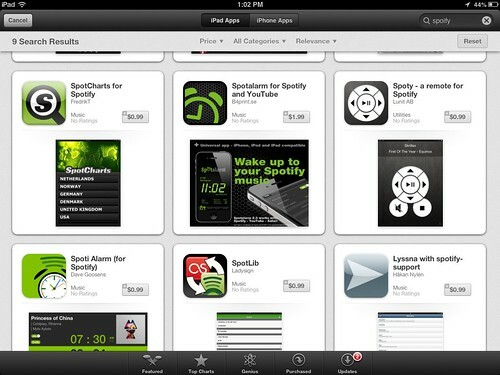 There's an alarm clock for Spotify! There's also a remote app that you can get too, so that if you have Spotify streaming at home during a party you can use the app on your phone to control it. I was stunned that there are some great apps that you could buy to enhance the experience, and to be honest I have very nearly gone and bought a couple already. Oh, and a couple of random apps like mission of God, and “the cat app” (seriously, is there ANYTHING that cats aren't associated with). So for now, I think I will review what I want the most: unmetered streaming or apps like an alarm clock that will wake me up playing music from Spotify (that seriously beats my usual painful alarm). Decision deferred!